Babcock 2015 - 11 years of running at Babcock! 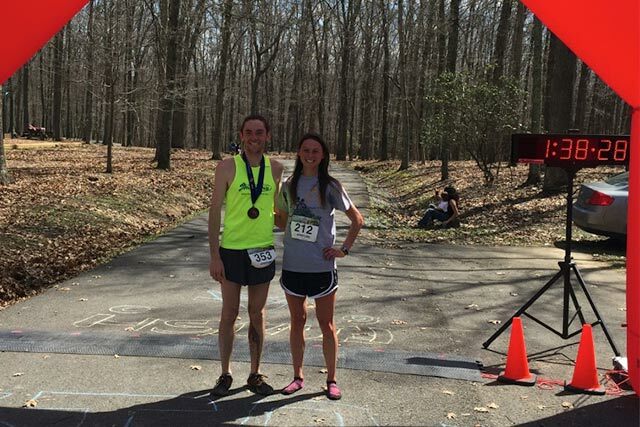 The 2015 Gristmill Grinder was another incredible race! What a day! It was obvious as I was driving to the park that we had a memorable day in the making. As the sun hit the ground and warmed the early morning dew it turned into a ground fog, a sign of warming. Though still cool out, we all knew it would be a warm one... and indeed it was. In fact, the temp actually went into the upper 70's by late afternoon. Too hot if you ask me, and 250 other folks that would be running the Grinder this year. This would one of the records that would be set today - the highest temps ever for our annual Gristmill Grinder! It is always so cool how at this race, and other trail events like this, the people are all so happy. They are smiling, hugging old friends and making new ones. Sure there is some competition out there, but more than that there is support and joy just to be there. Trail runners are just like that. They cheer each other on, pick each other up, and then try to outrun you - and then repeat that process. It is a beautiful thing. As the clock moved closer to the start time you could feel the energy beginning to build, some excitement and nerves were visible in the prerace chatter. We have our quick race meeting then, one minute before the start - it is quiet. Everyone is getting focused, preparing to go on their own personal journey both inside and outside. And in a fingersnap the 2015 race is on! 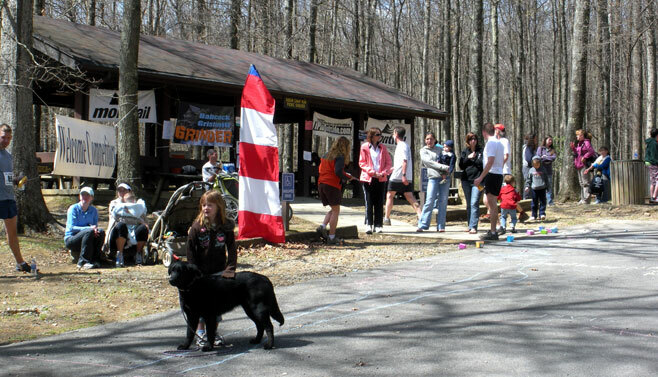 With cheers from the crowd, over 250 runners begin the journey through Babcock State Park. The course is amazing really- crossing creeks, climbing mountains, running on moss and rocks, even clawing with your hands to climb. Waterfalls, bridges, mud, cliffs. Single track, double track, road sections. Babcock has it all. There were some elite runners in this group, a few men that had each won this race previously. Some others that had not raced here before but wanted to claim the title. When it was all said and done, there would be a new overall winner for the men - Andrew Rhodes from Morgantown took the prize with a time of 1:26:28. Second overall was Robert Smith from Huntington, less than 5 minutes back with a time of 1:31:12. What a great showing from these guys! In the Women's catagory, we had no previous winners racing this day, so who would claim the title? Well we didn't have to wait long to find out- our new overall winner for women would be Lizzy Gleason from Athens, OH - but not only was Lizzy the fastest woman, she was third overall in men & women and set a new course record for the women with her time of 1:36:02!! Wow! The previous record was held by Heather Parks in 2010 with her winning time of 1:40:46. Finishing second overall for the women this year was Audrey Larrimer - also from Athens, OH with a fast time of 1:52:33. Great job ladies! 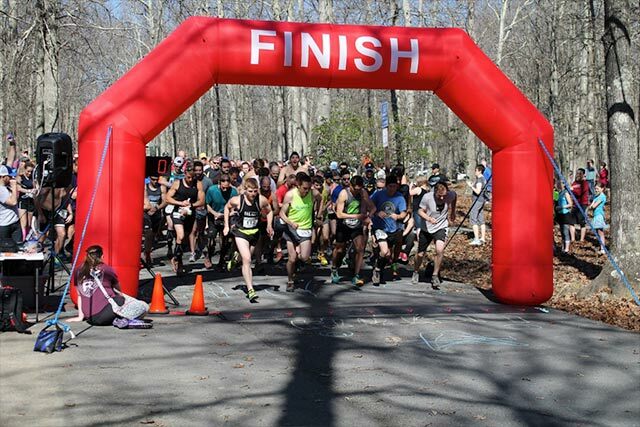 We had 248 finishers this year in the half marathon. Not all that started finished the course due to the heat or injury. We also had a few new types of recognition for this year- our oldest finisher, our youngest finisher, and the furtherest travel to the race. Our youngest finsher was Morgan Gray from Milton WV - she is 15 years old! 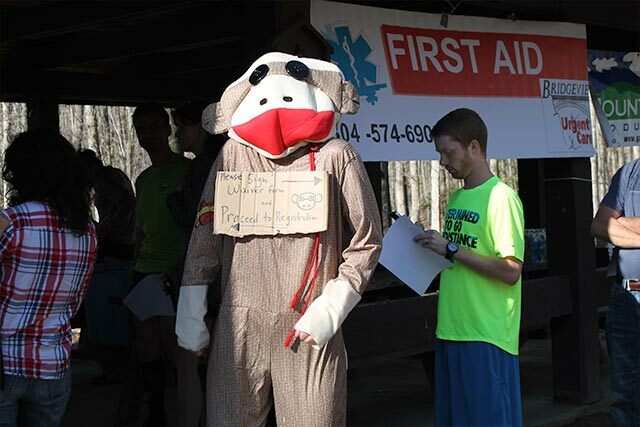 On another note - Morgan won our Sticks and Stones race last October!! Our oldest finisher - and a Babcock vet - was John Sheets from Saint Albans WV - he is 71 years old. Our racer that traveled the fartherest? That was Shawn Gralinski. Shawn is on an active tour of duty in Kuwait and flew back to the USA on Wednesday before the race. He asked for a special leave to be there. Thank you Shawn - we are honored and happy that you could join us! Well I guess that about wraps up another year of the Gristmill Grinder. I hope you will continue to tell your stories and share with us how it felt for you, what you saw, what you took home. I hope you will just be sitting at work and start smiling or laughing over something you did or didn't do. I hope you wear your finisher medal all week, you earned it! Here are some links for you- I will be uploading my images to an online gallery as well and sharing the link when it is done. They are random shots as always taken from different locations along the course. Anytime you are heading this way for a run, let us know - we may just join you. Until then - Happy Trails! !